Yeah, so I’m in Paris…but what happens in Ep3?? It was an old problem of mine. I had arrived in a new place, the place I had always dreamed of visiting, and yet I was wrapped up in something quotidian and banal, unable to remove myself from the everyday struggles of my normal life and contextualize myself in the magnificent present. I like to talk about my beginnings in Paris because I think they really defined my experience of the city, of study abroad, and of being alone, and exemplify the way I go through many periods of my life. This will be a reflection post about my time in Paris, but also a recommendation to you, because I certainly wish I could have done many things differently. What I want you to take away from this, however, is that I never for once regretted my decision to go abroad, and in fact believe that it is an absolutely indispensable experience that every student should take advantage of, if you ever get the chance. Once we landed, all of us were shuttled to a hostel on the opposite side of the city. I’ll never forget that drive, how we first traveled through generic highways and then emerged onto small Parisian roads, and I saw, for the first time in my whole life, signs in a language I didn’t yet comfortably understand – words like “Brasserie” and “Cordonnerie”, that would soon become familiar but that at the time marked my entrance into a totally foreign world. L’autoroute gave way to narrow, cobbled streets with cafés and their black-and-orange awnings and circular tables. I was here. Paris, Paris, you’re in Paris. A sentence I would say to myself every day for the next 160 days, one that I still don’t totally believe was ever real. At the same time, the old world called me back. At the airport, I had tried to socialize, talking to virtually everyone on my group flight, but I was crippled three ways by my Sherlock preoccupation, physical nausea and social discomfort at having to a) make a completely new group of friends for the first time in two years, and b) speak in a language that I hated (I still feel my terror at hearing a classmate ask, “are we supposed to start speaking French yet?” the moment he joined the group at JFK – no, we’re in America! We speak English here!). I was in the city of my dreams, yet I was still paralyzed by the old middle-school rejection fears. So instead, I threw myself into what I was comfortable with. If I could do it all again, I would have decided early on just how much I was going to immerse myself in Paris, and consequently how little or how much I was going to keep in touch back home. In Paris, I met – for the first time, really – that specter, homesickness. I thought Paris was too pretty for it; I thought I wouldn’t miss any part of the world I had temporarily left behind. But the love I found for my family and for my homeland in France was wide and unexpected. It’s the study abroad cliché: I discovered a dormant appreciation for the United States once I left it behind. It was in part because I didn’t find the warmth I had longed for and expected in my host family – although we developed a good relationship and ultimately I believe they were the best fit for me, the loneliness I felt, living on Boulevard St. Marcel, blindsided me. I missed my mom. 99% of the students I had talked to before arriving in Paris had told me that they’d loved their host families, describing them as their “second families” and making me very excited to meet mine. So, my first tangible piece of advice for all those looking to go abroad: not all host families are alike. The inherent nature of your relationship with a host family is actually quite impersonal: you are a paying guest in their home. Expect to arrive and have to make the proactive effort to become a part of the family and to make friends on your own. You will not necessarily have a readymade group of people to fall onto during hard times. For me, some of the hardest times I had in Paris were directly due to conflicts I had with my host family. I gave myself a pep talk every time I came home, putting on my “French face” before pushing open the door and singing out “Bonnnnnsoirrrr!” in my most upbeat, yet not-too-boisterous tone. Positivity is infectious, my dad always says, so I figured my being happy would decrease the chances of my host parents being upset. It came to the point where I’d look forward to shutting myself into my room and alternately watching Parks and Recreation and scrolling through Facebook for hours into the night. I think I took refuge in my friends back home largely because, for a long time, I didn’t really feel welcome in Paris. That being said, I absolutely recommend living with a host family if your primary goal in studying abroad is improving language skills and learning about a different culture. They taught me so, so much about French culture and more so, about myself and how I interact with other people. The experience challenged me to become more considerate and more sensitive. I actually got more in touch with my own culture grace à my host family, because they always asked me questions about how Americans or Chinese people went about eating, or having guests, or traveling, etc. I contemplated the question where am I from more than ever before. I learned more from the everyday experience of living with them than I did in any class, combined. I’ll never forget the Chinese meal I cooked for my host family during our last full week together. My host mother and host sister helped me cook the garlic green beans, while I made Szechuan eggplant and scallion tofu. Although the taste was so different from anything they were usually accustomed to, they loved the meal! They also gave me my final “test of Paris,” wherein they asked me twenty questions about France and the city – name three emperors of France (Louis XIV was not an emperor, mind you), who is the present mayor of Paris (Anne Hidalgo), name three uniquely French foods, etc. – and presented me with a “certificate” of “Parisian-ship” afterwards. It was ridiculous and endearing and bittersweet. Maybe you’ll be lucky and your family will immediately see you as one of them – I certainly had a couple friends with families like that. For me, it was ultimately best to have to work for their approval and affection, and when I finally felt close, it was all the more rewarding. For some, the host family experience is horrible, and I had some friends who had to move out or change families. It’s a tough balance, and you have to figure out for yourself when to stay and when to go. Be attentive, but above all, be open. That’s my overall advice, in general, about studying abroad. There’s an entire world out there for you to explore! Yes, but where are you really from? Finally, I gave him the answer he wanted: my parents are from China. He smiled, then proceeded to say he’d once dated a Korean girl and showed me a picture of his ex-girlfriend, saying “don’t you look like her?” Well, we both…have hair, I thought. The thing is, he wasn’t being malicious. He didn’t even seem too creepy. When he asked me to get coffee, I even contemplated it for a second, how eager I was for French friends. I wasn’t angry with him; I was more annoyed by this “Asian as exotic” mindset that is prevalent in the U.S. but that I didn’t notice so much until I went to France. After I got a Tinder, many guys would greet me in Chinese or ask me where I was from, and for those that I didn’t ignore, I’d reply with a curt “dsl je parle pas chinois” (sry I don’t speak Chinese) in what I hoped was nonchalant internet lingo. Not that it mattered. 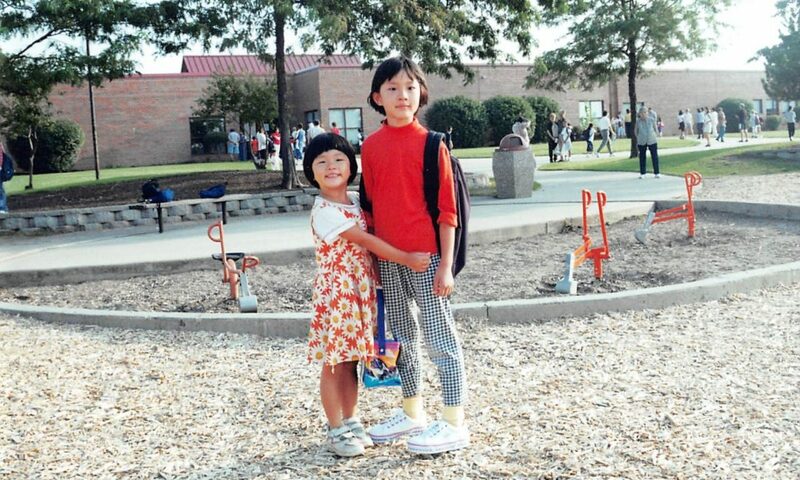 I felt all aspects of my “otherness” unprecedentedly: I was more obviously Asian, more obviously a woman than I had ever been in the United States. But maybe this is because I have not spent very much time in cities in the U.S. My friends are not all in agreement about this – some felt France to be a more tolerant place. They said that racism was more subtle in the United States, hidden beneath layers of political correctness. The French were more direct, in all ways. When they were curious about the color of your skin, they would ask, straight out. When they didn’t want you for a job, they would tell you immediately. So it is hard for me to compare, as I don’t know how many comments have been made about me behind my back in the United States. But that’s an issue that deserves a post of its own. Where am I from? : the question I asked myself the most, and what I believe to be the most important question that study abroad really pushes one to ask. I am very proud of my Chinese heritage, but I realized that I didn’t like being seen for purely that. I would correct strangers right away, making sure they understood that I AM AN AMERICAN. I felt that, because of my appearance, my Americanness was something more vulnerable, more easily trivialized in favor of my “exotic”, and obvious, Chineseness. I sought comfort in my roots. I frequented Chinatown and would go to China Supermarket every week to buy a head of napa cabbage, garlic, and the occasional sesame cake. Ironically enough, I ate more Chinese food in Paris than I ever do at school in the U.S. (where I settle for the monthly General Tso’s chicken). I remember searching high and low for peanut butter and refusing – in as polite and subtle of a manner as possible – to eat just butter and toast, and I remember fervently watchingThe Bachelor for hours, even as I sat overlooking Montparnasse Tower. In these moments, I felt bad that I wasn’t taking advantage of being in Paris. Every time that I would spend a full day indoors, I would kick myself. You live on Line 7, I’d berate myself. You can get to the Seine, Notre Dame, Île de la Cité, and any of the higher arrondissements in a manner of minutes, and you choose to sit inside?? It was hard to just let myself relax. At the same time, I never felt the frenzy of a tourist who has only a couple days in Paris. I never scaled the Eiffel Tower or the Arc de Triomphe. I only visited the Musee d’Orsay the last weekend I was in Paris, and for just an hour. These are regrets I’ll save for next time. I realized that comfort was good and necessary and that I shouldn’t feel like I was wasting my time whenever I was comfortable. But I also came to see that comfort could be my enemy, if I constantly used it to hide from the strange and stunning. Making friends with French people was one of the hardest things I’ve ever pushed myself to do. I failed often. I never really made friends in my university class or in my extracurriculars at the university. But I made friends at the professional school, where I helped with English. I made friends who came with our program on excursions. It was really the luck of the draw, and every experience required that I actively put myself in a place of intense awkwardness. I literally invited myself to group outings, saying, “If you guys ever go out together, I’d love to come with!” It paid off. In fact, my being foreign actually turned out to be a blessing in disguise. It imbued me with a weird sort of confidence; I reached out to more people than I would have in the States, with the classic excuse – I really want to improve my French – and when I tripped up and said something dumb, I just laughed and blamed it on my inability to speak French (when I make the same mistakes in English, I can’t use that excuse. When I screw up in English, it’s because I’m just that uncool). In fact, there existed no cool or uncool – there was only good French and bad French, which was something I could control or at least improve upon. In February, I wrote in my journal: “Paris is different than I imagined. Or maybe it’s me that is different.” The experience certainly wasn’t the whirlwind fantasyland ecstasy trip that I’d expected. I was not always happy. My life was not a constant glamorous musical accompanied by Je ne regrette rien on a perpetual loop. I didn’t have escapades with mysterious French men (though I did have some hilarious and awkward Tinder experiences). I felt normal almost always, and any changes that did happen occurred without my noticing until I left. Most days, I rolled out of bed past 10 am, contemplated trying to be fashionable, and ended up wearing the same Marilyn Monroe men’s t-shirt for the third day in a row. It rained more than it should have, and I often had to make a run for the bus when I left my apartment at 10:50 am for an 11 o’clock class. Truth be told, I was tripped up more often by everyday nuisances like charging my cell phone credit more often than I was by any large culture shock. I thought that coming to Paris would force me, by virtue of its foreign-ness, its dreamland qualities, its being Paris, to forget about Sherlock – to leave my American troubles at home. But it didn’t, and in time I got over them by myself. The place doesn’t change you. I found that I could travel the entire world but if I held on to the same old worries, I’d always be the same. Paris, with its myriad of uncomfortable situations and unbelievably beautiful churches and people, did not make me forget – it instead forced me to confront my flaws, the way I treat challenges, and friends, and disappointments. So, if you can, go away from what comforts you. Put yourself in a place that terrifies you, and one day you’ll be one place braver. I do not suddenly want to become a surgeon or an investment banker or something else totally un-me, like an athlete; I’ve come to understand a little more what I like and don’t like, and discover more what I can do, and have always been able to do. I am the same, with a few new realizations. I don’t know how to respond to the question, How was Paris?, because how could I answer that in one conversation? It was amazing, it was okay, it was challenging, it was so many feelings at different times and I could never possibly tell you all of it. My one real piece of advice is to go see for yourself.